Update – July 27, 2018: It’s official! Jeonju is going “Dog Meat Free”. Nami Kim (SaveKoreanDogs.org) has shared the uplifting news that her team held a further meeting with Jeonju’s Mayor Kim Seung-Su, and they have now received his official confirmation that Jeonju is going to be a “Dog Meat Free” city. And, action has already begun with a draft in place for a “Dog Meat Free” animal welfare master plan. Update – March 28, 2018: The City of Jeonju and Animal Protection Group Work Together to Send Rescued Dogs from Osongje to Their Forever Homes! In 2017, the city of Jeonju created an animal welfare group in an effort to improve animal welfare policies and projects, and has pursued research projects to create an animal welfare master plan for the city. Through the research project, the city plans to: conduct a survey among companion and livestock animals related occupational groups on animal welfare, and their perception of animals; establish basic direction and policy goals on animal welfare for the city; identify detailed strategic projects based on the policy goals; and build an animal welfare system that encourages participation of all classes of residents. Mayor Kevin L. Faulconer of San Diego: Tell Sister City, Jeonju, South Korea, That We’re Opposed to the Torture and Consumption of Dogs and Cats. Jeonju became Sister city with San Diego in 1982. Jeonju is one of the largest dog meat consumption areas in South Korea. If you have ever wondered what hell would be like, just visit or watch the videos of dog slaughterhouses, markets and restaurants scattered all throughout Jeonju. There are countless dog slaughterhouses, markets and restaurants where the dogs, who are tortured their entire lives, end up being slaughtered in the most inhumane ways, such as by electrocution, hanging or beating; and then thrown into boiling water – sometimes while they are still alive. In many places, dogs are being killed in full view of other terrified, caged dogs; and this takes place in public and in broad daylight. In addition, many abandoned and stolen former pets end up in this industry, and are subjected to the same cruelty. A Search Engine reveals the sickening scale of Jeonju’s dog meat demand. 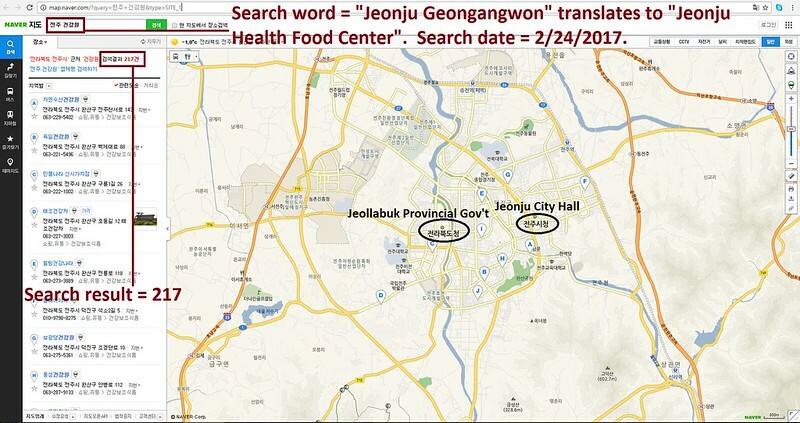 The searches resulted in: 217 Health Food Centers; and 27 restaurants in and around Jeonju. 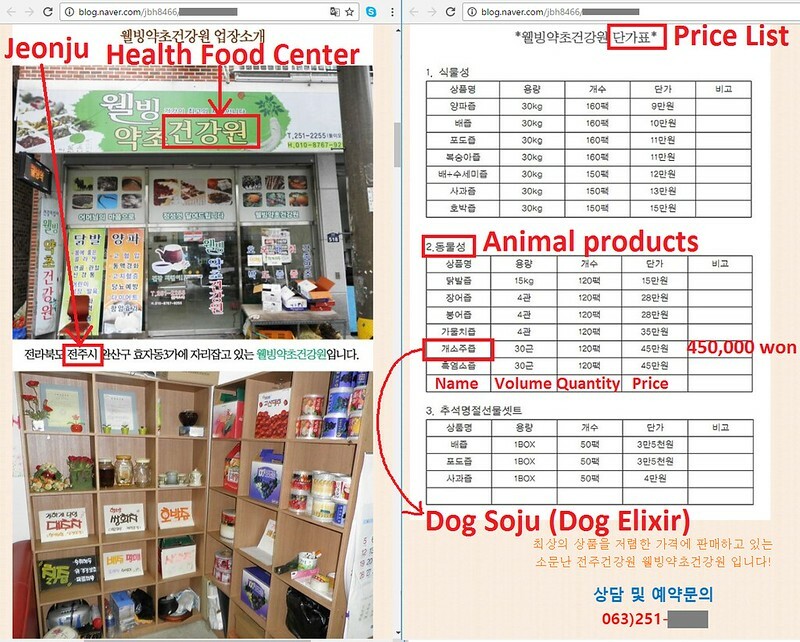 Even if half of these ‘Health’ Food Centers and restaurants serve dog and cat ‘ingredients’ in one form or another, just imagine how many dog/cat slaughterhouses must be present in and around Jeonju in order to supply all of these outlets. Please sign petition, call and email San Diego Mayor Kevin L. Faulconer, TODAY! To send an online message to the Mayor: CLICK HERE. Jeonju is one of the largest dog meat consumption areas in South Korea. The Korean internet searches resulted in: 223 Health Food Centers which commonly sell dog/cat elixirs (also known as dog soju and cat soju); and 30 dog meat soup restaurants in and around the city of Jeonju alone. No matter where you live PLEASE SHARE these actions with your friends – especially those who live in San Diego! Please let live dogs and cats, they are our friends. Dogs are our friends, members of the family ! This disgusting industry is being viewed by the whole World and seen as vile, as are the people inflicting this horrendous cruelty! Utterly unacceptable and must be stopped! Horrific. Horrendous. Diabolical. Primitive. Savage. Barbaric. Shameful. These are just a few words to describe what image the continued torture and consumption of dogs and cats is giving to the world……a despicable image created by the superstitious populations of South Korea. Forgiveness for these continued atrocities will NEVER come, and Karma WILL visit with a vengeance. It is way past due that South Korea climbs above all the superstitious beliefs its populations are steeped in, and moves into the 21st Century. PLEASE, it is in your power to mandate that the existing laws are enforced to the fullest, to get this abhorrent practice stopped permanently, and without delay. The City of San Diego should not be a Sister City to any city in any nation that allows dogs and cats to be tortured and eaten. These are not the acts of desperately hungry people, killing animals as painlessly as possible to feed hungry families. No, these are despicably callous and barbaric sadists acting **for profit**, killing these poor animals as painfully as possible because pain and fear hormones supposedly tenderize the meat and guard against heat stroke and/or impotence (!!). Perhaps you haven’t heard this yet, but Jeonju is one of the largest dog meat consumption areas in South Korea. 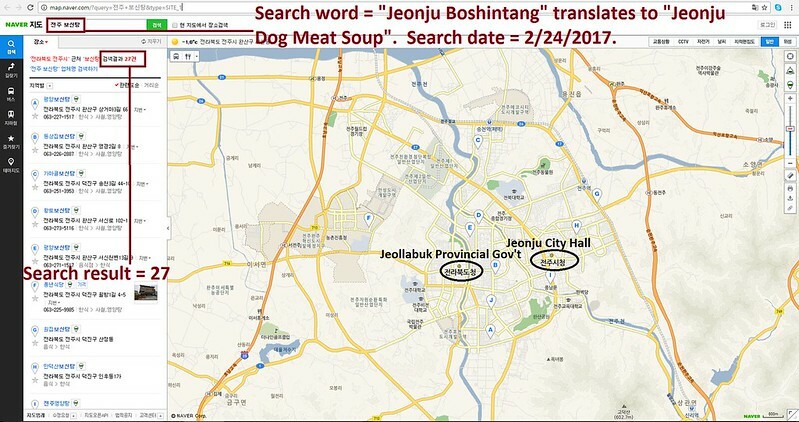 The Korean internet searches resulted in: 223 so-called “Health Food Centers” which commonly sell dog/cat elixirs (also known as dog soju and cat soju); and 30 dog meat soup restaurants in and around the city of Jeonju alone. Please notify Mayor Seung-Su Kim of your awareness of the worldwide protests against this horrific (and now supposedly illegal!) industry in their country and vehemently urge them to close down ALL dog farms and slaughterhouses, markets, truckers and restaurants who serve their products as soon as humanly possible. San Diego should not be a Sister city to any city that allows dogs and cats to be tortured and eaten. Period. Again, please urge Jeonju Mayor Seung-Su Kim to close down all dog farms and slaughterhouses, markets, truckers and restaurants who serve their products, ASAP. Horrified animal lovers the world over (including some Koreans themselves!) call on you to ACT to STOP this hellish industry. Dog and cat lovers are boycotting all things Korean until they finally decide to leave the Dark Ages on this issue.